According to a new market report published by Transparency Market Research, the global algorithmic trading market was valued at US$ 8,373.4 Mn in 2016 and is estimated to expand at a compound annual growth rate of 10.2% from 2018 to 2026, reaching US$ 21,807.6 Mn by the end of the forecast period. According to the report, North America was the largest contributor in terms of revenue to the algorithmic trading market in 2016. This is primarily due to strong technological advancement and considerable application of algorithm trading in several end-users such as banks and financial institutions across the region. Emergence of AI and algorithms in financial services sector and rapidly growing demand for market surveillance are the major factors which are expected to fuel the growth of the algorithmic trading market across the globe. Demand for artificial intelligence (AI) and algorithmic trading solutions in the financial services sector is continuously rising. This in turn is boosting the algorithmic trading sector across the world. Furthermore, increasing adoption of non-equity trading algorithms by institutional asset managers is raising the use of artificial intelligence in the financial services sector around the globe. Apart from this, the growth of the algorithmic trading market is mainly driven by the growing demand for market surveillance. By using market surveillance technology, traders are able to keep track of their trading activities and investment pattern. In addition, the rising need to build an economy with global as well as regional interdependencies force key vendors to formulate effective marketing strategies and develop new solutions for market surveillance. This in turn is expected to drive the algorithmic trading market during the forecast period. In recent years, banks and financial institutions have invested in the upgrade of IT and infrastructure to perform faster trading activities, particularly in algorithmic and high frequency trading solutions. Furthermore, end-users are upgrading their system arrangement by embracing a range of managed services and platforms. Thus, unceasingly growing adoption of algorithmic trading solutions and managed services among end-users are fueling the growth of the algorithmic trading market across the world. The global market for algorithmic trading is segmented on the basis of component, trading type, and geographic regions. Based on component, the market is segmented into software and services. The software segment is further split into on-premise, cloud-based, and hybrid. The services segment has been categorized into outsourced/managed services and professional services. In 2017, the software segment accounted for the largest market share, in terms of revenue of the global algorithmic trading market. Shifting trend toward cloud-based solutions is expected to accelerate the demand for cloud-based algorithmic trading software around the globe. The technology is gaining popularity in capital markets due to its flexibility, scalability, cost-effectiveness, and massive processing power. Based on trading type, the global algorithmic trading market is segmented into forex, stock markets, commodities, bonds, and cryptocurrency. In 2017, forex trading platform segment accounted for the largest share of the market, while, cryptocurrency trading platform segment is estimated to expand at a substantial rate over the forecast period. Based on geography, the global algorithmic trading market is segregated into North America, Asia Pacific, Europe, South America, and Middle East & Africa. Among these regions, the market for algorithmic trading in North America is expected to hold a dominant position throughout the forecast period. However, Asia Pacific and Europe are expected to contribute significant market share during the forecast period. Furthermore, the Asia Pacific algorithmic trading market is anticipated to expand at a significant growth rate during the forecast period. Algorithmic trading solution providers are expanding their product portfolio through mergers and acquisitions, which provide them a larger customer base with enhanced and advanced electronic trading platforms. Companies are also focusing on winning long-term contracts and providing multi-service platforms to their customers. 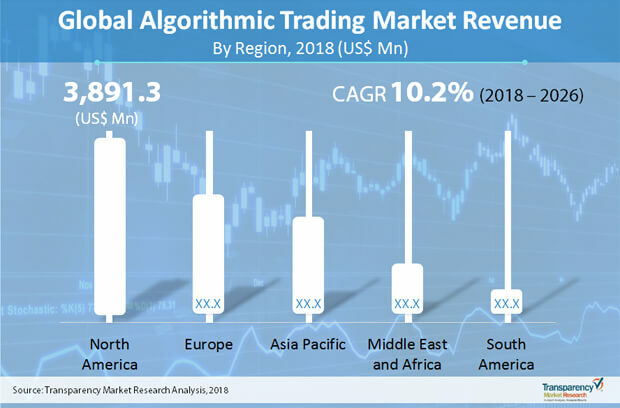 The global algorithmic trading market includes different players such as Trading Technologies International, Inc., Argo Software Engineering, Inc., Automated Trading SoftTech Pvt. Ltd., InfoReach, Inc., Kuberre Systems, MetaQuotes Software Corp., Software AG, Thomson Reuters Corporation, uTrade, and Vela Trading Systems LLC (OptionsCity Software, Inc.).